Pacira announced results from a study on an Exparel (bupivacaine)-based pain management regimen for reducing postsurgical complications associated with opioid use. The results were presented at the American College of Surgeons (ACS) Clinical Congress, held from October 26–30 in San Francisco, CA. In the independent, physician-initiated study of 82 patients undergoing open ventral hernia repair or laparoscopic colon resection, 37 patients received standard of care (intravenous hydromorphone or morphine with or without epidurals and/or IV acetaminophen [SOC]) and 45 patients received infiltration with Exparel plus SOC. Patients receiving Exparel experienced statistically significantly lower rates of urinary retention (0% vs. 10.8%), respiratory depression (2.2% vs. 21.6%), and high fall risk (8.4% vs. 16%) compared to those receiving SOC only, respectively. As well, an increase was seen in the number of patients classified as low-risk for falls (48.7% vs. 37.6%, respectively). 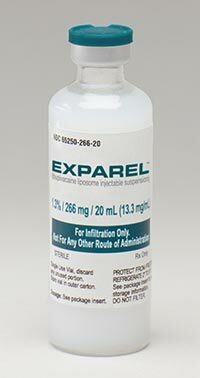 Exparel is a local anesthetic indicated for administration into the surgical site to produce postsurgical analgesia as a single-dose administration in adults. For more information visit Exparel.com.